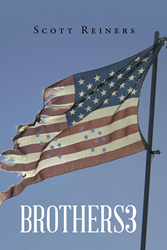 Recent release “Brothers3” from Page Publishing author Scott Reiners is a spine-chilling account about brotherhood and unity as the characters find themselves on the radar of menacing and deadly forces. Scott Reiners, a practicing veterinarian who, with his wife, founded the Mountain View Equine Hospital in Virginia, has completed his new book “Brothers3”: a dark tale of struggle as Sam and his brothers go on the defense while confronting destructive legions of corrupt and raging armies. Published by New York City-based Page Publishing, Scott Reiners’s remarkable account is filled with twists and turns that lets the readers feel the turmoil of the societal struggle for dominance and control. Readers who wish to experience this epic work can purchase “Brothers3” at bookstores everywhere, or online at the Apple iTunes store, Amazon, Google Play, Kobo, or Barnes and Noble.